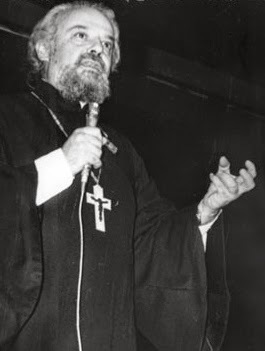 Unusually among Orthodox clergy, Alexander Men was born into a Jewish family near Moscow in 1935. When he was only seven months old, however, his family converted to Christianity and became members of the underground Catacomb Church. This also was unusual because there was little benefit and much danger in becoming an unofficial Christian in the Soviet Union of the 1930s. Perhaps, therefore, the roots of Alexander's courage and individuality lay in his genes. A very bright student, he was nevertheless expelled from college in 1958 for openly espousing Christianity. This, however, only confirmed him in his commitment to becoming a priest. After graduating from Leningrad Theological Seminary, he was ordained a priest in 1960. Well read, intelligent and a powerful debater, he quickly became a popular speaker and teacher and seemed to have the knack of appealing to all classes of society; sometimes called “the apostle to the intellectuals,” he was equally comfortable with his ordinary parishioners. His open missionary and evangelizing work attracted the attention of the KGB and he was repeatedly arrested and questioned but continued his work regardless. Between his charismatic preaching and his books, he became a well-known and popular figure even, during the communist period. Seraphim Joseph Sigrist, former Bishop of Sendai and East Japan, says of his books: “The writing is simple in a way, although an intellectual festival at times, with poets and philosophers introduced but never with a sense of display. There is an absence of ideology and even of theology in the usual sense; instead there is a presence of reality and of God.” His books ranged from the popular to the academic and his first major book, Son of Man, published in 1969 is credited with introducing Christianity to thousands of Russian citizens. Fr. Alexander's first five books were published in Belgium under a pseudonym and circulated in secret. However, even before the final collapse of the Soviet Union, he was openly setting up Christian organizations, including an Orthodox Open University, a Youth Missionary School and a charity at the Russian Children's Hospital. He set up the first Sunday School in post-soviet Russia and one of his last acts was to found the Russian Bible Society in 1990. All in all, he was a central figure in the transition period under Gorbachev and has been called the architect of Russia's religious revival. On September 9, 1990, Fr. Alexander was walking along a forest path near his home in Semkhoz. It was Sunday morning and he was on his way to catch the train to a nearby parish where he had celebrated the Divine Liturgy for the past twenty years. He was attacked with an axe by one or more unknown assailants and died instantly. Although a full investigation was ordered by the governments of both Michael Gorbachev and Boris Yeltsin, the murderer has never been identified and neither the axe nor the briefcase Fr. Alexander was carrying were ever found. Two suspects, one an alcoholic neighbour, the other a person from a nearby village known for his erratic behaviour, were arrested but both were immediately cleared by the local court. The main focus of the investigation was on two scenarios, both somewhat unlikely. It was suggested that Fr. Alexander was killed by fanatical Jews because of his own background and his success in converting many Jews to Christianity. At the same time the police were exploring the possibility that the killers were anti-Semitic fanatics or even extreme conservative Orthodox opposed to his modernist tendencies. However, it has been pointed out that in a police state, as Russia still was, it is extremely unlikely that an “ordinary” killer would escape arrest for long. The general opinion was that the KGB were most likely the culprits either officially or as a rogue act of assassination in the dying years of their power. Perhaps the truth will never be known but it does seem likely that the motive for the murder was related in some way to Fr. Alexander's position as a Christian, a priest and an activist. Whether or not he is worthy of glorification as a saint, as many believe, there is little doubt that he should be regarded as a martyr.